With a synergistically acting combination of ingredients designed to attack fat from every angle, and what many think is the best range of flavours around, Oxyshred is the number one fat burner on the market, and one of our best sellers. How long before I see results from my Fat Burner? Firstly, diet is the number one factor that determines weight, and fat burners are going to work best alongside a healthy diet. This sounds very obvious, but you will see results sooner if you are following a weight reducing diet plan. 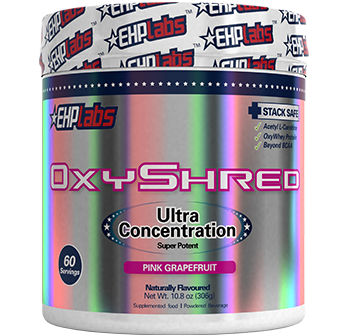 Oxyshred and many other fat burners can keep you on track, because they contain ingredients that suppress the appetite. This can help keep the snack cravings at bay, help you reduce your portion sizes, and stop you going back for seconds. Losing weight relies on burning more energy than you are taking in. Various ingredients in Oxyshred and other fat burners promote this in a number of ways - through thermogenesis, by speeding up the metabolism, or by blocking the absorption of calories from food. The best way to use more energy, and kickstart your fat burning, is through exercise. People who perform regular exercise are going to see quicker results than those who do not. Exercise is a great way to burn fat, but it is also a great way to put on muscle. Muscle is heavier than fat, so it is important to realise that your results are more than just a number on a set of scales. It is common, particularly if you're usually pretty inactive, to put on a bit of muscle weight when you first start exercising. If you're looking for results, try looking at the tape measure or the waistband on a pair of jeans, don't concentrate on the scale. The good news for you is that unlike fat, muscle burns energy, so you're going to develop a faster metabolism and see better results in the long run if you exercise. Your starting point is also going to determine when you start seeing results. People who have less to lose will find their average weekly weight loss more noticeable than someone who is larger, and may start to notice the changes sooner. Finally, everyone is different. What works well for one person might not work at all for another. Our advice is to finish your sixty serve tub of Oxyshred (unless of course, you are experiencing side effects), which will take a month at the recommended dosage, and reflect. Have you been relying too heavily on Oxyshred and neglecting diet and exercise? Have you been measuring success by the scales alone? Have you been missing doses? If you can answer no to all of those questions, you should be seeing results by the end of your first month. With a reduced calorie diet and exercise, most people will see the results of a fat burner like Oxyshred within a month.